In December, I plowed my way through all seven seasons of "Gilmore Girls." I had forgotten how much I loved that show -- the quick talking, the pop culture references, the quirky townspeople, the grumpy Luke, and the relationship between Lorelai and Rory. One thing that really bothered me though was that Rory only applied to Yale and Harvard, as if it was a given she'd get in. Just because she was smart doesn't make that a given. She only did newspaper, and she wasn't even the editor. And one day hammering walls for Habitat for Humanity doesn't cut it for volunteer work. Sooo unrealistic. As if the show was realistic anyway. Ha! 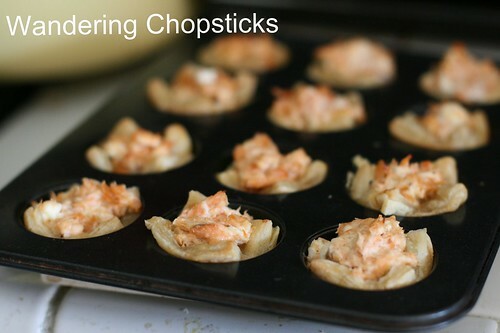 So recently when I was making my standard Baked Salmon with Lemon Pepper Seasoning, I decided to use the leftovers to make these salmon and dill mini tarts. 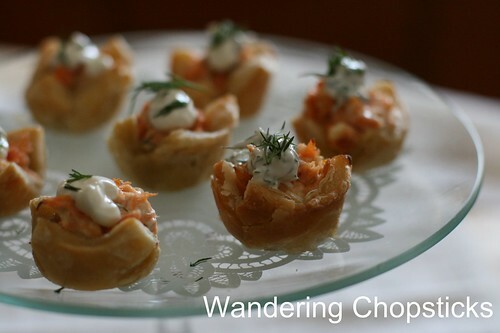 Add a bit of sour cream and cream cheese to the salmon and baked them in puff pastry with another dollop of sour cream and dill on top. 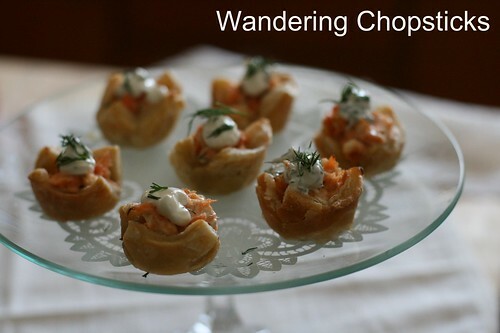 Serve these as appetizers for a dinner party and they'll go just like that. 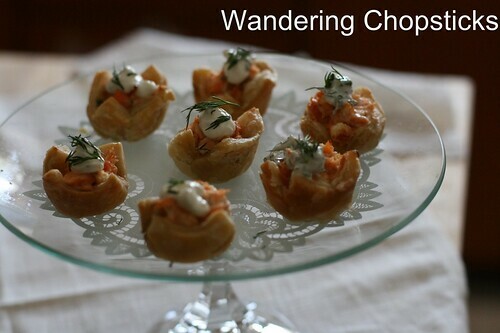 I liked them best when the puff pastry and salmon filling were still warm, to contrast with the fresh coolness of the sour cream and dill, but they tasted just fine when cooled too. 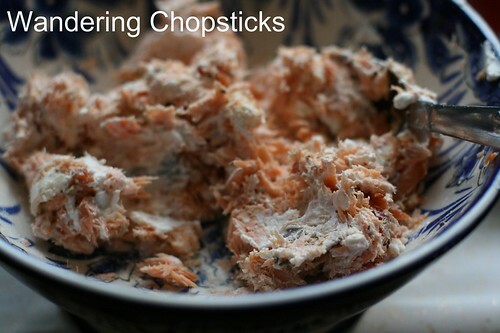 Make Baked Salmon with Lemon Pepper Seasoning, or whichever method you prefer. 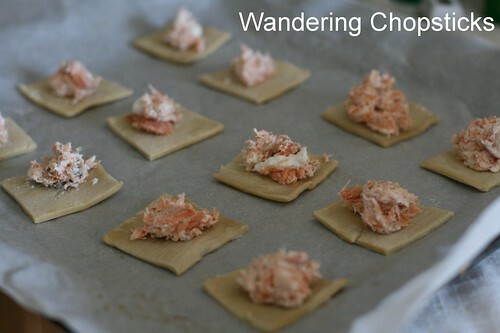 Mix in 2 oz of cream cheese and 2 tblsp sour cream. The lemon pepper seasoning should be plenty enough seasoning, but if you need more, taste and adjust if necessary. Set aside. 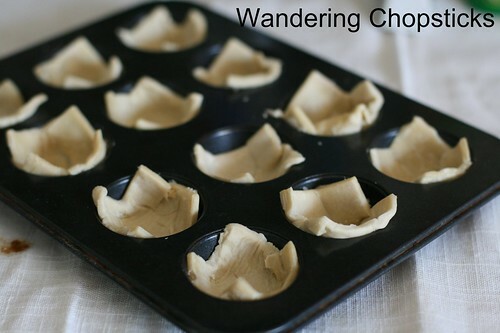 Cut the puff pastry to fit into a mini cupcake pan. 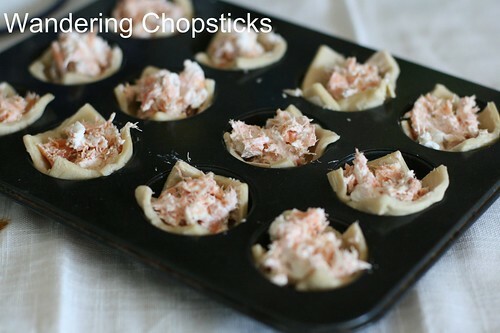 Spoon the salmon mixture into the little puff pastry shells. 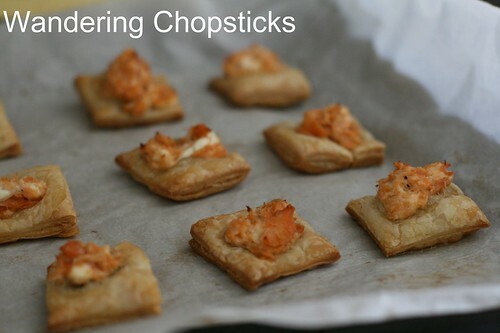 Bake in the oven at 350 degrees for about 15 minutes or until the puff pastry is golden. In case you don't have a mini cupcake pan, I also cut the puff pastry sheets into roughly 2-inch squares. Just spoon the mixture on top and bake same as above. 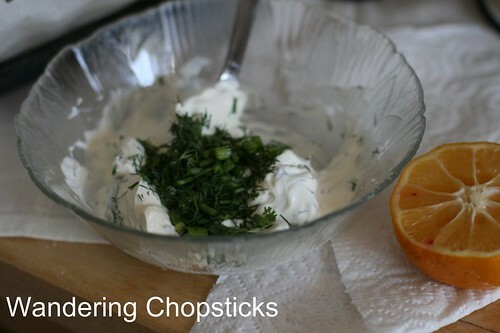 Meanwhile, make the topping by adding chopped dill to sour cream and squeezing in about a tblsp of lemon juice. 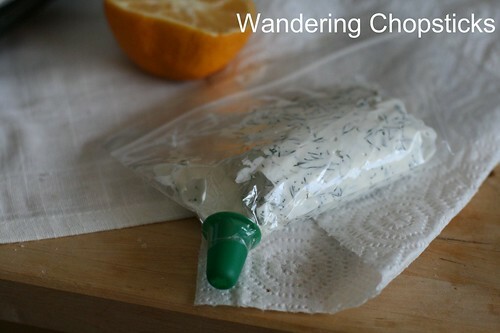 I put the mixture into a sandwich bag, where I had snipped out a corner to put in a pastry tip, but the dill was too big to squeeze out properly. So it's probably best to just use a spoon for the topping. After 15 minutes or so, you get this. Plate. But wait, I'm not done. 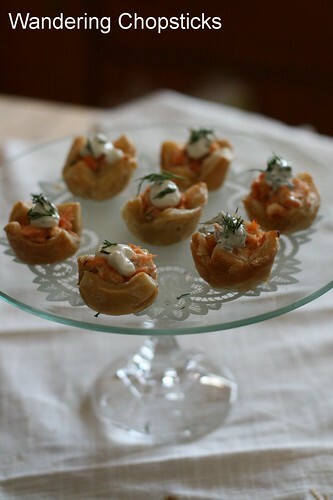 Add a dollop of the sour cream and dill on top of each mini tart. This is what the non-cupcake pan mini tarts looked like. Still pretty tasty-looking anyway if you want to try the recipe and don't have mini-cupcake pans. But if you do, then these look and taste much better. 1 year ago today, sparkling wine and pinot noir tastings at Argyle Winery - Dundee - Oregon. 2 years ago today, Canh Tao/Rong Bien (Vietnamese Seaweed Soup). 3 years ago today, Bamboodles Restaurant - San Gabriel (Closed). 4 years ago today, Angkor Thom: Victory Gate, Bayon Temple, Prasats Suor Prat, Terrace of the Leper King, Terrace of the Elephants, and Phimeanakas - Cambodia. 5 years ago today, Japanese Gobo Root (Burdock) Fries. These look and sound delicious. They seem like they should be easy to pull together and yet still look quite fancy. Those tarts look awesome. I might have to get a mini muffin/cup cake pan just to try this. 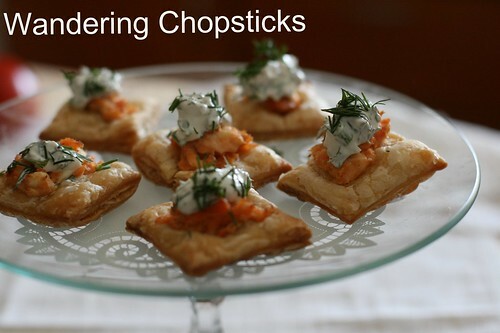 Lovely idea for easy finger food! You made me laugh: I discovered Gilmore Girls on regular tv here a few years back. Helped me with my Dutch. Yep, I had subtitles in Dutch, girlfriend! and you have to laugh when colloquialisms get translated...very wrongly. 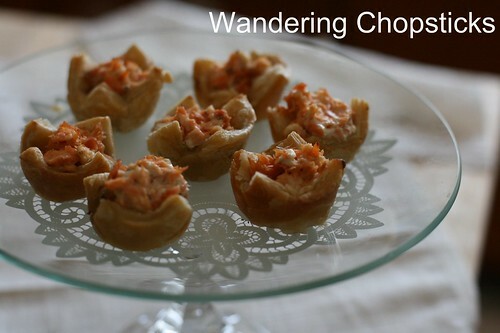 But those lovely salmon tartlets, nothing at all wrong with those. Yum! Thanks! This was super quick to make, but I kept putting it off forever. Yeah, no way would Rory get into those schools in real life. And nothing's wrong with UConn! I bought my mini pan from Target for $2.50! That's how I feel trying to read Harry Potter in Vietnamese. Some translations are hilarious.